Kristian Randjelovic has been working as an LGBTIQ activist, in Serbia, for more than ten years. His work is heavily focused on the rights of transgender and intersex people, an issue which he has spoken ardently about in the media, drawing from personal experience. OutRight: What first made you want to advocate for LGBTIQ rights? How did you get involved with your earliest activism and current organization? Kristian: Being [a] trans and intersex person [made me want to advocate], and [from the] time that I [realized] that, I was [the] only visible one. I wanted to share my experiences and knowledge with others, I was thinking how I can help others to feel less alone and to be braver, and get out of closet. [A] doctor ([who] was one of [the] medical specialist [on] the team working with trans persons in [the] early [90’s]) approached me and asked me to participate in [the] first TV show on trans issues. This was the first step [towards building] my public activism. After that I joined [the] NGO Gayten-LGBT and [started] to work on developing programs for trans people in Serbia and [the] ex-Yugoslavia region. XY Spectrum is [a newly] founded organization, which is working with intersex, trans and non-binary persons. 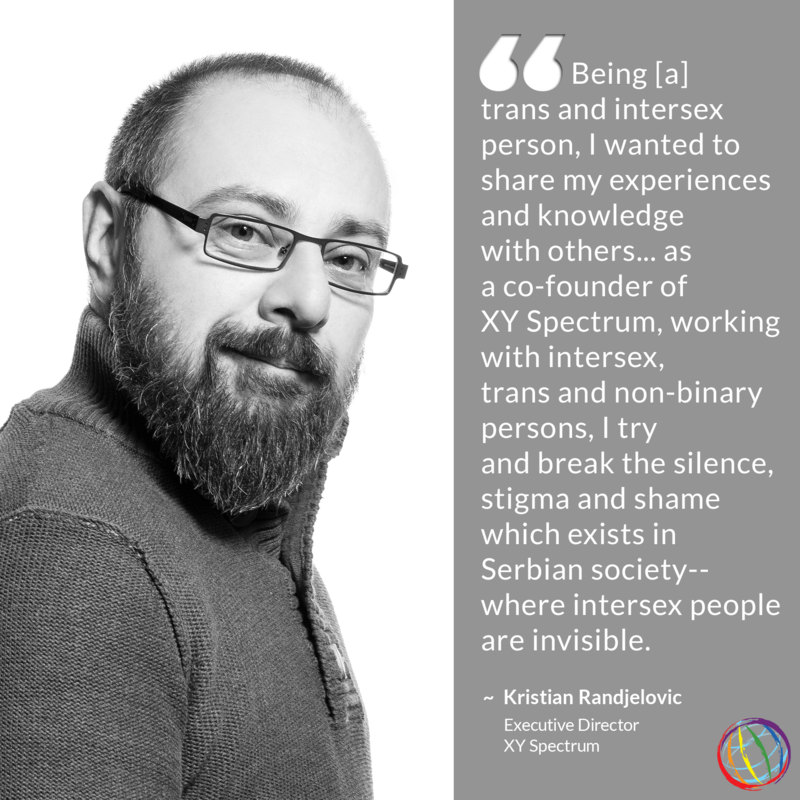 I am one of [the] founders, and for me [it] was very important to work on intersex issues [using] my personal experiences (I discovered that I am intersex later in life) to try [and] break [the] silence, stigma and shame which exist in Serbian society–where intersex people are invisible. Kristian: For intersex people, information, policy papers, resolutions and declarations on intersex issues are crucial. The shift towards human rights of intersex people has great impact on my work and I hope it will help me to [find] more allies in this struggle. In our [organization’s] approach, from top to bottom, [it] is very important, it is very hard, to reach out to [the] intersex community. But from these learnings we can continue our work building allies and supporters. Establishing safe environment and validated recognition from different partners…can help intersex persons open [up] and to reach out. [The] stigma, shame and trauma is very high in Serbian society. Kristian: [Our] organization is newly founded, we [don’t] face political obstacles, but [we face] social ones on different levels of our work. We tried to organize trainings in schools for parents (state funded) for their staff on intersex issues. We started negotiations as [an] informal group and it was very promising. But as soon as we registered [our] organization we didn’t received any response. On meeting with [the] midwife (she is [the] owner of [a] private School for parents) intersex people were verbally discriminated and pathologized. Trans people, especially trans women, are [also] subjected to discrimination and violence. In [the] last few months three trans people were attacked. As is the case in much of Europe, awareness of intersex and trans rights are still developing. There is still a discrepancy in the level of recognition the world affords intersex and trans issues, in comparison to the visibility lesbian and gay rights sometimes receive. Still, activists like Randjelovic are pushing through the obstacles and working to create opportunities for trans and intersex-aware programs that are crucial to foster inclusive policy and expand the LGBTIQ community.